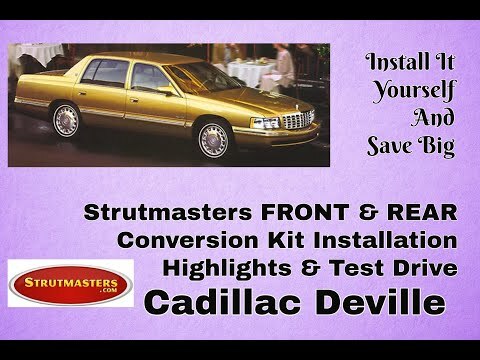 Strutmasters 1985-1990 Cadillac Deville 4 Wheel Air Suspension Conversion Kit is the perfect solution to your air suspension problems. Designed to be very affordable, you can convert your air suspension to use standard shocks/struts and coil springs for less than the price of replacing one air strut. 1985-1990 Cadillac Deville 4 Wheel Air Suspension Conversion Kit CA14F is the perfect solution to your air suspension problems. Designed to be very affordable, you can convert your air suspension to use standard. We designed this air to non-air suspension conversion kit CA14F for the 85-90 Cadillac Deville to save our customers time, frustration, and a lot of money. 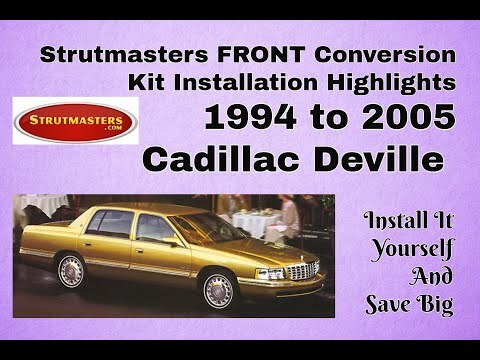 The kit eliminates the need to bring the Deville into the dealership each time one part of the suspension system needs a repair or replacement. This gets costly and is very inconvenient. Now, you can stop worrying about each and every component working in sync. This kit includes two shock absorbers, two coil springs, and two completely pre-assembled coilover struts that are installed easily. DIYers love the detailed instruction manual that helps get the kit working in about one hour per wheel. Our kits deliver high quality at a fraction of the cost of direct replacement at the dealer- it√¢¬Ä¬ôs no wonder people make the switch. 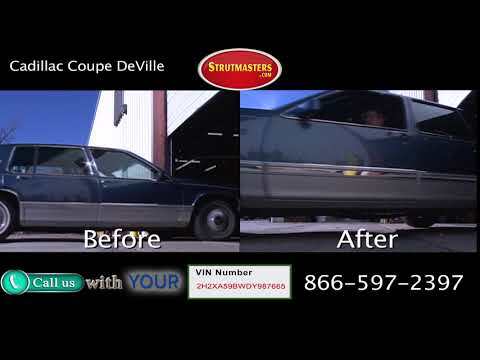 If the 85-90 Cadillac Deville is not reaching and maintaining its proper ride height, it may have a failed or leaking air suspension system. Look for these common signs to help you diagnose a bad suspension before it‚Äôs too late and total failure renders the Deville immobile. The most noticeable is a sudden uneven height difference between different sides of the Deville. Typically the rear end fails first causing it to sag but the front end remains inflated. This makes the car ‚Äúsquat‚Äù down lower than normal. Sometimes there is a slight lean from one side to the other. Either way, if not fixed promptly, other components will wear out. The air compressor, for example, may have stopped working or may run too often/long. A bad suspension is likely, and a repair or replacement is necessary if there is an illuminated suspension warning light on the instrument cluster. Research your direct replacement, repair, and replacement options carefully, as not all of them offer high quality and affordability. = TOTAL: Over $1,430 (and that still doesn‚Äôt include replacing electronic components that are known to fail such as the height sensors). 1985-1990 Cadillac Deville Electronic Struts (x2)- a type of shock absorber; has metal tubing filled with gas-charged hydraulic fluid that is connected to the wheel of a vehicle in order to reduce the effects of vertical travel on a rough surface which controls the bounciness, and therefore comfort, of a vehicle. 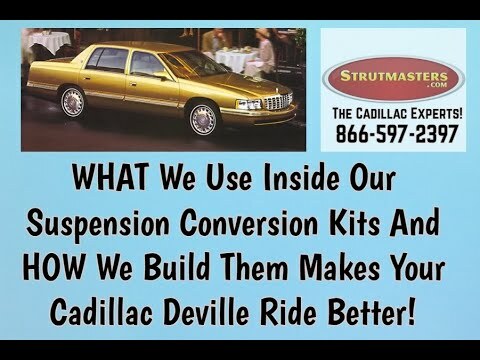 The 1985-1990 Cadillac Deville struts, while having coil-springs, use an electronic signal to stiffen or soften the dampening of the strut. 1985-1990 Cadillac Deville Shock Absorbers (x2)- a metal tubing filled with gas-charged hydraulic fluid that is connected to the wheel of a vehicle in order to reduce the effects of vertical travel on a rough surface which controls the bounciness, and therefore comfort, of a vehicle..
1985-1990 Cadillac Deville Height Sensors (x2)- a linkage located near each wheel of a vehicle with any electronic suspension that, either mechanically or electronically, constantly measures the height of the vehicle, and reports this information back to the control module so that the computer can identify if changes in height need to be adjusted accordingly. The ride height sensor is a moving part, and like all moving parts, they will eventually wear out. 1985-1990 Cadillac Deville Air Lines- tubes that run from a compressor (air suspension) to the air struts which carry pressurized air to the air bags components in order to adjust the height of the vehicle, respectively. 1985-1990 Cadillac Deville Control Module (x1)- a computer which is responsible for the operations of the air suspension system and maintaining the vehicle√¢¬Ä¬ôs correct ride height. 1985-1990 Cadillac Deville Suspension Control Module- a computer which is responsible for the operations of the air suspension system and maintaining the vehicle√¢¬Ä¬ôs correct ride height.